These rubber stamped paper gift bags coordinate with our Warm Winter Wishes Greeting Cards. Both projects are fairly easy to make because you use only one colour of ink, embossing powder and a single large rubber stamp. Insert a piece of wood into the gift bag that is larger than your rubber stamp image. I used a small wood cutting board for this. Using your rubber stamp positioner, position your rubber stamp image as desired. Stamp the image. I used a single rubber stamp [Warm winter wishes] as well as a few small snowflake stamps. Be careful not to smear your inked image. Add a few snowflakes around the top area of the stamped image. Using a dabber [a small piece of cosmetic sponge works great, if you don’t have a dabber] apply a small amount of pigment ink around the bottom area of the bag. This creates the snow that you see in the photo. embossing powder. Any residual powder left around the image will emboss, so be sure to remove any that is unwanted. I continued the snow effect around the entire bottom of the bag and added an image to the back of the bag, using the same method, with a very small snowman rubber stamp. 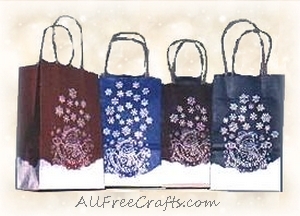 These bags are very easy to decorate. If you have never rubber stamped before, you may want to practice a little on some paper first. The art of stamping takes a little practice to achieve perfect stamped images, but it isn’t all the hard.